Ever wanted to put a rug somewhere, but you just couldn’t find the right size? Odd shaped areas can be tricky, but you can cut down a rug to fit exactly where you need it in no time at all. 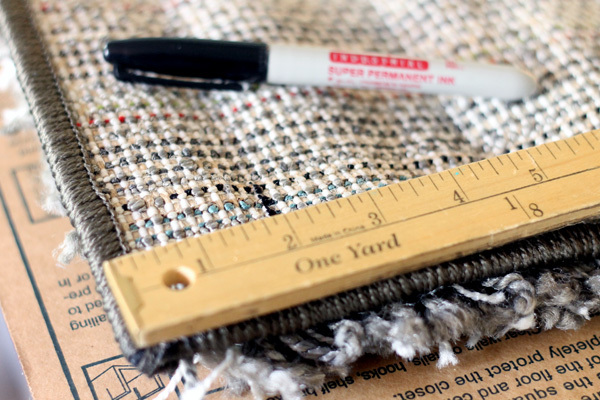 With only a marker, a yard stick, utility knife and a hot glue gun, get the perfect size rug to fit your space in just a few minutes. First measure from the corner in however much you want to trim on each end. I wanted to trim off two inches, so I marked two inches in on each side. Then draw a line from end to end to mark your cut line. 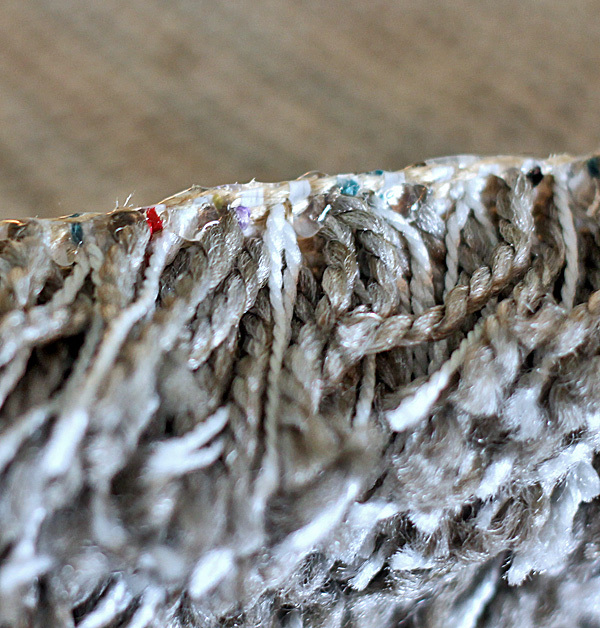 Lastly, run a thick line of hot glue, right on the edge, to seal the rug fibers to the matting of the rug. Let it completely cool and you’re done. 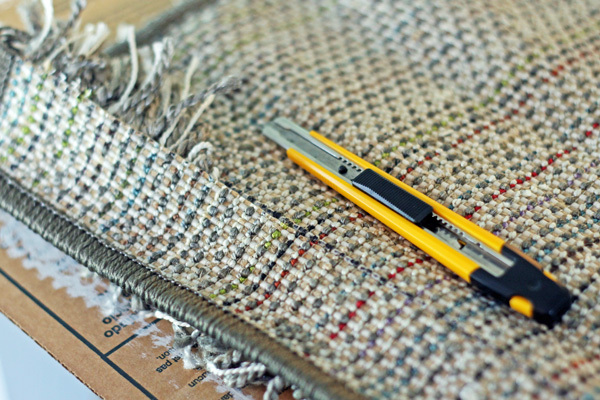 You can customize your rug to fit your space in about five minutes – and it’s so easy that anyone can do it. Oh, Gina! From the title of this post, I had visions of you pulling out the lawn mower! 🙂 Thanks for the practical advise, as usual. Have a great day! This is awesome. 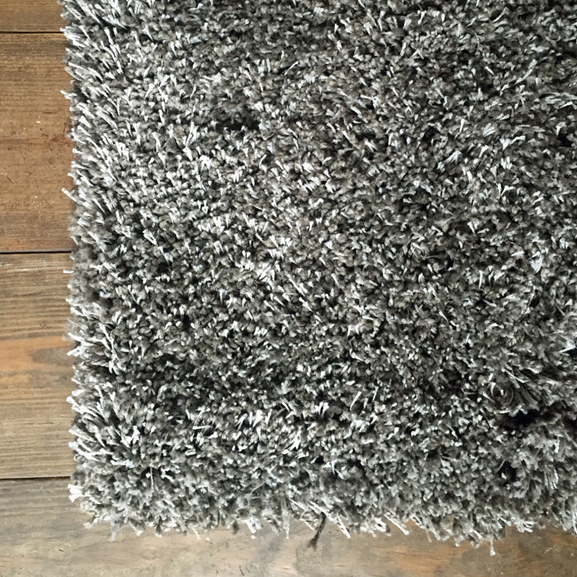 I have a shag rug from Ikea that looks very similar to the one you did. My old cat was sick and had an accident on the floor next to it, and of course it soaked into the rug. I rolled it up and dragged it into our laundry room. We’ve tried everything to get it out, including saturating it with a gallon of Nature’s Miracle. I just didn’t feel comfortable putting it back out into the family room for fear that one of our cats would smell it and pee on it again. I didn’t want to throw it away because I really liked it, it was practically new and it wasn’t terribly inexpensive for us. After a year of tripping over the rolled rug, I finally decided to make a last ditch effort to save it and googled “Can you cut an area rug”. Thank you, thank you!!! I’m sure you had no idea someone would use your idea for that purpose but it really helped save our favorite little rug…makes our basement theater so cozy! hi! 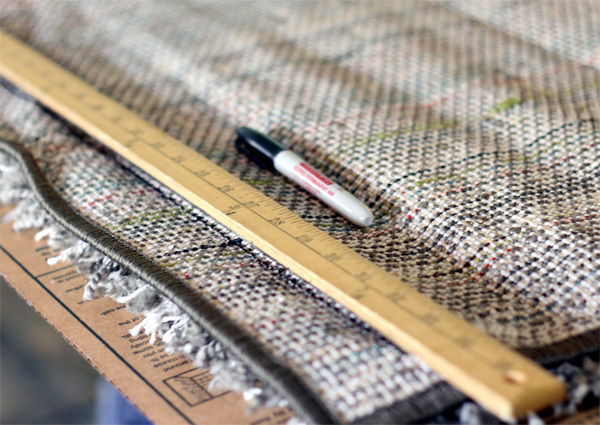 i had a large rectangle area shag rug i wanted to cut in half and make into a long runner. everyone told me not to do it and said i would ruin the rug. i went online to get some tips anyway and your tips and encouragement were the best. i followed your super easy and clear guidelines and voila i now have a new runner rug! thank you! What happens when you wash the rug? Does the superglue come out? What about multiple washes? Brilliant post Gina! Am about to get my ruler, utility knife and glue out to change a rectangular rug into a round one! Thanks so much. Ha ha, thanks Marie, good luck! !